I use primarily spinning tackle. I know how to fly fish but I am not a real expert at it and I do not really enjoy it. 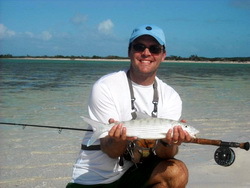 So after a discussion with a friend of an employee who went to the Turks armed with only spinning tackle and who caught a lot of bonefish, I made my first trip to the Turks in 2009.The clear advantage to spinning gear over fly tackle is the wind. There is usually a 10-20 mph wind blowing on the Turks and a spinning rod gives you much more control than you could ever get from a fly rod. And yes, I can hear the fly fishing enthusiasts challenging me on that fact but I know what I prefer.One our last trip in January we caught 21 bonefish the first day all ranging between 2.75 – 5.5 lbs. The second day we fished for bigger fish only landing 10 of them and lost three that we could see weighed in excess of 7 lbs. My first fishing excursion was a half day trip with a guide who brought me a few miles outside the harbor. 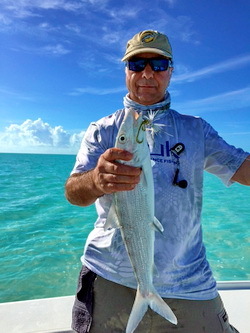 There was no wind – one of my only times bonefishing where there was no wind – and he proceeded to point out bonefish ahead of the boat which I would cast to. 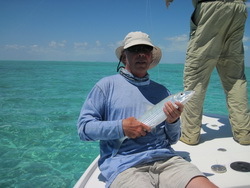 It took about an hour to adjust my style of fishing to being a bit stealthier as bonefish do spook easily. 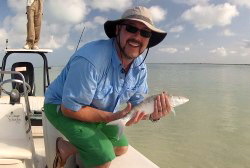 Finally my first bonefish was hooked.Sure, I have seen how they run when hooked on television shows but none of that prepared me for the wild ride this fish put on. I started fishing using a white teardrop jig head with white hair and trailer that the guide had suggested. After catching a few fish on these jigs I was continually changing up lures to see what the fish might hit best. 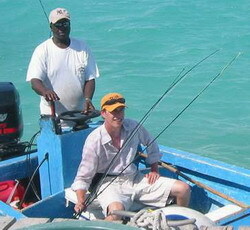 When not fishing with a guide there are plenty of ‘drive-by’ fishing opportunities on the island of Provo. What makes the Turks special for me is it’s not only a small island that you can get around easily on, but there is a lot for non-fishing spouses to do as well; snorkeling, parasailing, spa treatments, and island shopping. 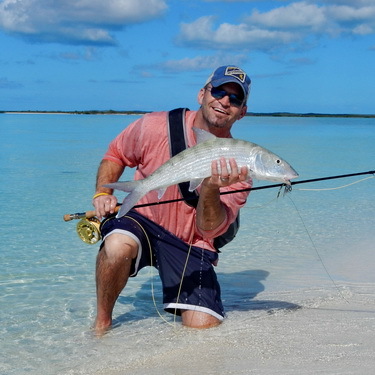 So, if you don’t fly fish and you have always wanted to catch some bones definitely grab a 7’ spinning rod and head to the Harbor Villas in Turks for an incredible experience. There have been very few times in my life where words have failed me. This is one of those occasions! Fishing with Darin was a truly unforgettable experience. We may have to retire as nothing could beat what Darin shared with us! He went above and beyond all expectations. What a pleasure! 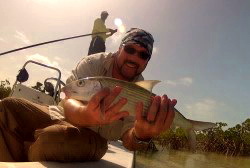 It is with mixed feelings that we head back home to Florida but I am very confident that we will return and we will encourage some of our bonefish buddies to follow our lead.So until we meet again, I hope you both remain healthy and happy and your resort flourishes as word travels. Thank you for your extra care and incredible hospitality! DIY BONEFISHING..........We stayed a week at Harbour Club Villas and Marina in the Turtle Tail area of Providenciales away from the hustle and bustle of Grace Bay. This was my third visit to Harbour Club and as usual our accommodations were immaculate and our hosts, Barry and Marta, were most accommodating with the most recent dining and fishing suggestions. Barry told me about a new way to drive out to Bonefish Point, which avoided the bone-jarring, unmaintained road I used to take. Whether you fish or not, Bonefish Point is one of the most scenic coastlines anywhere and is well worth the half hour drive from town. I fished either side of the low and had shots at cruising and tailing fish in the 5-7 lb. range. The bottom is uneven and wave-swept. I found it easiest to wade out to a 12-14 inch depth and just wait for fish to come by in addition to walking the shoreline and watching the water in front of me. My second opportunity arrived, a small group of fish, but they looked big. A tough cast in to the wind, but my cast landed short. “Cast again,” I was told. I water hauled and laid the fly down in to the zone and we clearly saw the bone eat, get hooked, shake his head ferociously, and then run to what felt like the horizon. This fish took me in to the backing twice before he came to the boat. We quickly snapped a pictured of this six pound prize, and sent him on his way. Another attempt proved to be more fruitful and this fish was every bit of seven pounds. This beauty ran so hard and fast that I was not sure I had enough backing. Soon after the first run, the fish turned and swam right back at the boat and while I reeled as fast as I could, I saw a large shadow follow behind. “Is that a shark following?” “No I don’t think so,” The bone made another run and turned right towards the boat again, this time more frantically. “That IS a shark following,” I horsed in this beautiful fish right to the boat, plain to see… the biggest bonefish I have ever caught, grabbed the leader, and gave a solid yank. I would not pose with my trophy this time, I would willing fully pay for his face piercing to let him dart off in to the mangrove to safety and away from the man in the grey suit. I grabbed the leader, that is a caught fish… and I did the responsible thing. I hooked about 15 bones and landed over half of them. I certainly had the opportunity to hook a lot more as well. The average fish was pretty decent size and they were aggressive. 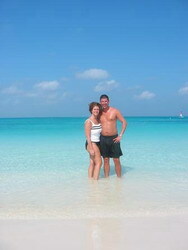 We went to several flats and cays and were the only ones around. 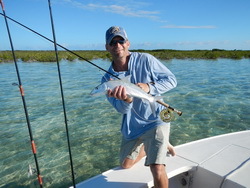 Pine Cay and North Caicos were great. The first fish I caught was by far the largest and was beautiful, about 26in and 8lbs. To remember the trip I had a replica mount made of this fish and the fly that I caught him on is in the replica's mouth. Saw tailing and cruising bones a couple mornings in Flamingo Lake and Turtle Lake and it seemed that around 7am there was the most activity. 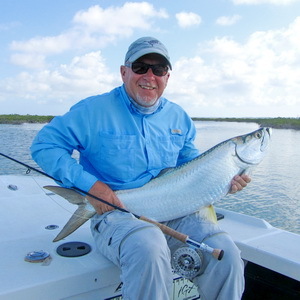 As we approached a junction of channels our guide stated that he had seen some tarpon a few weeks earlier. No sooner than finishing his statement I spotted 8-10, what I thought were monster bones. "Those are Tarpon man!!!". Even though I only had my 8 wt. bone fishing rod he rigged me a heavier leader and tarpon fly. One cast and I was hooked up but the fight quickly ended with a gill slapping jump. 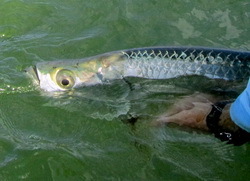 We quickly re-rigged another setup and again I immediately hooked up only to have the tarpon quickly break off. One last chance with a heavy leader was delayed as the fish disappeared. After searching for 15 minutes we spotted the fish again. The guide moved me into position and bingo another hook up. After several jumps we got the fish to the boat. MY FIRST TARPON! ON A FLY! WITH AN 8WT! Our great guide coached me through reviving this beautiful fish so he could fight again. Watching him swim off was a lifetime experience. Oh, we estimated him to be about 45lbs. The size didn't matter, he was just beautiful and an unbelievable fighter. 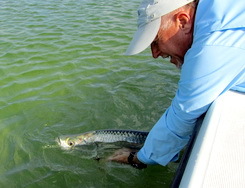 My first Tarpon on a fly and I know it is not my last. Thanks. I'll never forget the experience. I get up early, and head down to Flamingo Lake, one of the two saltwater lakes the Harbour Club overlooks. Standing by the shore, I see a big push within casting distance. Unfortunately, what I have in my hand is a cup of coffee, not my fly rod. The water is clear and only about two feet deep. I wade around for a while but return to the villa for breakfast with nothing to show for my efforts. 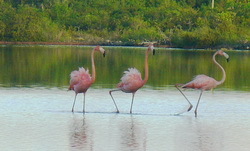 We return to Flamingo Lake after lunch and with the sun high and at our backs, we see lots of singles and pairs. Finally, we have at least seen bonefish! After a while, we separate. I walk a couple of hundred yards to a point and see a bust up of water within casting distance. 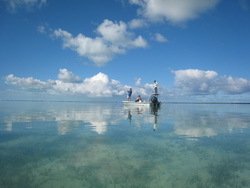 It is a shoal of fifty bonefish cruising. I make a bad cast, then a better cast, fish on! After three good runs, my heart pounding, I land a nice two pounder and somehow manage to juggle rod, fish and camera for photographic proof of my first ever bonefish. The next day, we meet our local guide and rods and gear aboard, we’re off to where the water is crystal clear no deeper than ten feet. Finally, the water shallows to two feet as we approach a sand bar. We anchor and walk a good ways, our guide searching for fish. The flat stretches for more than a mile in every direction. The guide doesn’t like what he’s seeing so he asks us to walk over the sandbar to deeper water while he goes back for the boat. As soon as we walk over the bar into the water we scare a pair of bones cruising the shoreline. We head farther south another ten minutes and anchor again. This time, after a short walk, we come upon a shoal of innumerable bonefish, estimated at a thousand. They are being pestered by two circling lemon sharks. With me casting left handed Craig right we separate by a hundred yards to get a better angle. This is easy pickings for first-timers and we immediately begin to hook up. We catch enough to stop counting, using small bead head Charlies. Casting into the middle of the school results in a hook-up every time. A better double-hauler could have easily caught a hundred fish in this one spot. After an hour and a half we return to the boat for sandwiches and a break. After lunch we move the boat to the mangrove shoreline of Middle Caicos Island and he begins to pole in four feet of water. We take turns on the casting deck and each hook larger fish than on the flat. My largest gets well into the backing but after a minute or so, breaks off. 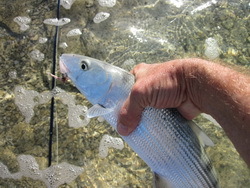 We head for slightly deeper water, using heavier flies. With the correct stripping technique, our guide shows us how to coax the fish up where we can easily see them following the fly. Finally, about 3:15 we begin to head back having been on the flats since 9 AM. It’s about a forty minute run back to the dock with a quick stop to see the “Blue Hole”, a circular drop off a hundred yards across and four hundred feet deep, easily visible in Google Earth. 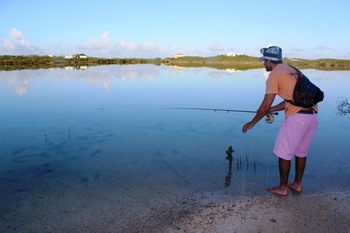 The Caicos Bank is so vast we come to realize that we could fish the flats and mangroves everyday for a year and never fish the same spot twice. All and all it has been a great trip and a successful introduction to bonefishing. The weather was ideal, the destination easy to travel to and the combination of both guided and DIY fishing offered us plenty of fishing opportunities. lagoon as Marta fires frame after frame with her camera. There is not a breath of wind. 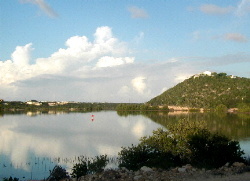 The surface is a sheet of glass, except for a wide, nervous patch of moving water. I cast directly into the center of what must be 200 gray ghosts swimming in unison like choreographed jets in an air show. I hook one instantly and the entire school follows its struggling brother. 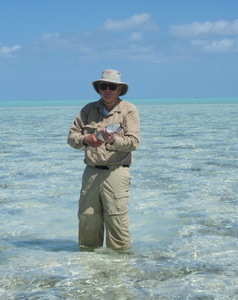 Cameras flash as I land the fish and quickly return it to the turquoise water. The school hasn’t moved far. For the next 40 minutes, bone after bone attacks my fly in what I can only describe as the antithesis of everything I know about the species. 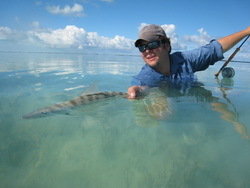 Bonefish are sly, wary, and cunning fighters. These fish would strike a hotdog if I presented it to them, and they have no qualms about swimming right up to the boat. Christen even lands a few after I hook them up. The day is perfect. 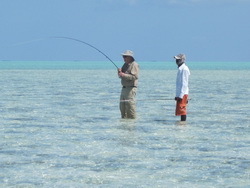 The areas close to Harbour Club Villas are great for self guided bonefishing. 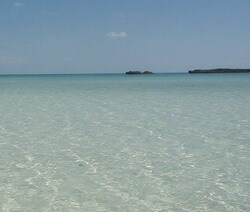 Two lakes, Flamingo and Turtle Lake, plus a beautiful ocean flat. Grab your rod and go when you want to go! 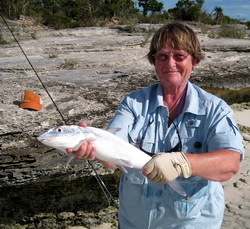 Specially for beginners of bonefishing, Flamingo lake offers a great opportunity to learn to spot, cast and to drill a bonefish. 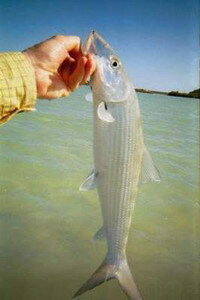 There are large schools of small and mid-size bonefish. 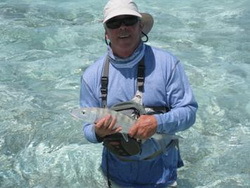 I caught 17 bonefish in four hours near of the Harbour Club Villas and had a lot of fun. Again, WOW is the only way to describe the sheer unspoilt beauty of this part of the island. 2 miles of flats from Osprey Rock to Bonefish Point. Small beaches with rocky outcrops. Soft white sand littered with thousands of tiny shells. The sea was calm and clear, the sun was hot, and there was a slight breeze. Perfect. My aim was to wade / walk North to Bonefish Point from the middle of the bay, and then back South towards Osprey Rock as the sun went round. 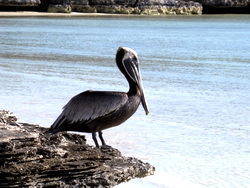 The bay was totally deserted, and the only company we had all day was an osprey and 3 pelicans. Slowly our eyes had become accustomed to scanning the water, searching for signs that fish had been, or were, feeding. Then I saw it. A shadow, about 40 feet away. It was moving from right to left of me, and slowly zigzagging. I cast to about 8 feet in front of it. I let the fly sink and then slowly I started to strip the line. I could feel my heart thumping and I hardly dared breathe in case I spooked the fish! There was a flash of silver and I felt an almost imperceptible tug on the line. I waited a split second then striped and struck. The line tightened and ripped through my fingers. I had it, I really had it! 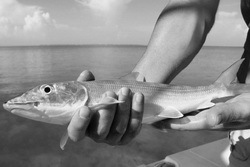 The fish had taken off with lightening speed, and all I could do was hold the rod as high and as tightly as possible. Eventually it slowed and I was able to wind a fair bit of line back onto the reel. By this time Keith had noticed that I had caught something and was getting the camera ready. Meanwhile the fish decided that it really didn't like what was happening and charged off on another run. This one was incredible. The reel spun, catching my thumb in the process.Ouch. That hurt! It took nearly 190 feet of line out, then suddenly it stopped. The line went totally slack. Keith shouted asking if I had lost it. I couldn't answer, I was frantically winding line back onto the reel. Then I saw the fish. It was heading straight for me. I wound faster. The line tightened, and the fish turned and ran again. Shorter this time and not as strong. After 2 more short runs I landed it. It was magnificent. 20 inches long and weighing 4 pounds 5 ounces. My very first Bonefish. I was ecstatic. Keith duly took photos of me with a silly grin, holding a stunningly beautiful creature. 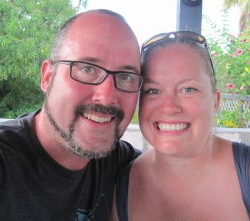 Our stay in the Turks and Caicos was awesome. My first time to catch bonefish and I'd like to express a huge "thank you" to both of you.was awesome. As you know, I didn't have a guide and learned a lot (by making mistakes) but had a great time. I was able to cast to, catch and miss a lot of fish. Some of these amazing fish would take me down to the backing three times. W-O-W! 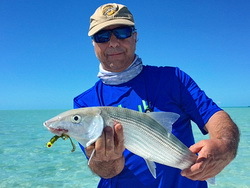 I had great success and cast to larger schools of bonefish on the SE portion of the island just west of Juba point in an area with "Five Little Cays".It's a huge flat that fishes well at low tide. Even at low tide the water was knee deep in areas. (Turtle Lake would be completely dry in areas at low tide...but you'd still see occasional tailing bonefish here and there. 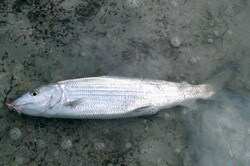 At lower tide levels it was easy to spot tailing bonefish (unless it was windy and then it was difficult). It was a long hike to get to it but worth it. Not a soul around, no people, buildings or anything...just you and the wide open water. I did see a large shark in this area in the distance as well as larger fish crashing in on the baitfish off of Bonefish Point. Looking at satellite photos of these islands, you can see lots of areas for Bones to roam. There are plenty of opportunities. I just wish I had more time to explore. I hope to return sometime soon. Thanks again for your hospitality! While I enjoy fishing, my wife looks forward to relaxing with a good book. See photos! We managed both easily and then enjoyed relaxing dinners out or used the BBQ to rustle up our own. Bonefishing in T&C is excellent. Directly in front of the villas is Flamingo lake with plenty of opportunities for the stealthy wade fisherman on the incoming tide. With a pair of binoculars you can see tailing fish from the villas and plan your approach. Schools of 20-50 fish plus some big singles roam these flats but can get spooky if you march all over the place! 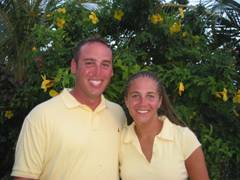 Barry & Marta will also direct you to other Provo bonefish 'hot' spots or can recommend local guides if you want to go further afield. Harbor Club Villas are the best! I have bonefished all over the Bahamas, Mexico and Central America and have never found a place like Harbour Club villas. 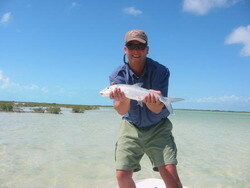 They have it all......great accommodations and fabulous fishing right in front of your own private villa. The fishing is just as good as it was before on my last trip. 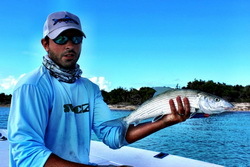 I caught 6 bonefish in one hour right in front of the villas. It still is one of the "hidden jewels" in bonefishing. And with lovely, attentive hosts. A treasure of a spot. by boat. There, the bonefishing was superb. Don't miss swimming on the public beaches over by the resorts.also on the beach across from the Marina and right next door. Have to come back for diving and snorkeling..and bingo at the Banana Boat. 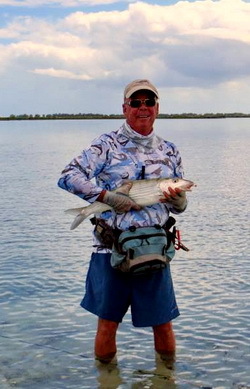 I very much enjoyed the local bone fishing, particularly down Turtle Tail and in Turtle Lake.That last Friday morning I had numerous good shots at medium size bonefish in Turtle Lake and only my technique prevented me from catching more fish. Even so, I hooked five and landed three in a few hours. Of the four local choices for fishing I caught good bonefish in three different places and had good chances at the fourth. 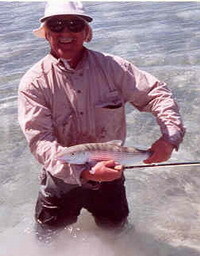 The possibility to catch barracuda and other species in the marina channel offered a very nice opportunity each evening. I would like to have a few more weeks to explore the vast amount of flats at the east end where Flamingo Lake drains to the sea. We fished the back country of North and Middle Caicos Islands, catching 12 fish the first day and 5 fish the second (half day). I lost 8 or 10 to mangrove roots and break offs and I had casts to many more. The typical fish was between 5 and 8 pounds with the largest nearly 10 pounds. Great snorkeling( saw eagle rays at Smith's Reef and Turtles at Coral Gardens . Kayaking around Turtle Lake , beachcombing at North West Point , watching full moon rise at Grace Bay , Bonefish Point beach with Captain Bill, visiting the beach at Malcolm Roads, Thanks to Barry and Marta for providing the beautiful surroundings at Harbour Club Villas and for their kindness and excellent advice on places to visit and to fish. I generally fished for a couple of hours a day, some days a bit more and on a few days, I didn't fish at all. Marta told me others said that one of the flats fished best after low water. I found this to be true but also got fish on the last of the ebb tide (and a few just after high water). I found the flat a bit too deep around high water making fish spotting quite difficult. I found the fish averaged 3 to 31/2 lbs and there can be a lot of them (there can also be very few) On several occasions I saw shoals of >100fish. Mark and Ursula Linton, Belfast, N.Ireland. 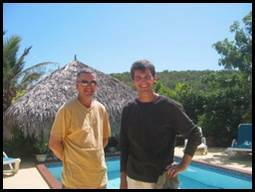 We preferred a more remote, self sufficient, uncontrived approach to the Turks and Caicos as opposed to the resorts and their "all inclusive" captivity. To each his own. 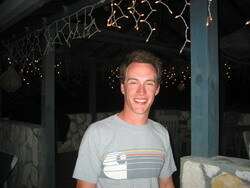 Do not get me wrong, those resorts are very nice but you tend not to explore as much. I for one, rarely travel to a destination without my fly fishing gear. 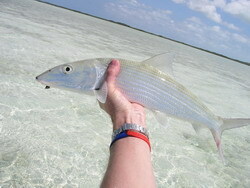 For those of you who are comfortable self guiding for bonefish, let me just say that bones are here! Nice chunky ones at that. I landed 4 bonefish with my 8 weight fly rod across the way in Flamingo Lake but my best day was spent 2 hours either side of high tide in Turtle Lake. Tailing, hefty single bones had me enraptured for hours. I stalked, cast, changed flies, lengthened my leader, changed flies, again...had countless very good shots even at a tailing school of about a dozen 20 feet away but didn't catch a one! Still, it was the best day of bonefishing away from all the cares in the world, relaxed under a tropical sun, I've had for years. behind about 3 foot of snow back in Connecticut . at night. Keep your eyes open for Jo-Jo!! Thanks again Barry and Marta for making our vacation one we will never forget. Matt and Karen White, Connecticut. the three days we spent here on our honeymoon. bonefish caught, make that our first six bonefish! host family at their home than staying in a hotel. wine. Above all else, the atmosphere was great. wonderful honeymoon. We'll send you pictures! 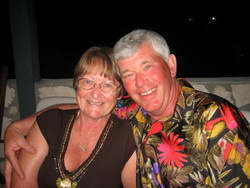 Upon or arrival at Harbour Club Villas, we were greeted by our hosts Barry and Marta. After settling in, Marta kindly offered to take use to the IGA to stock up on groceries. Thanks Marta! The following day I decided to take the day off from fishing and relax around the pool. This was a mistake on my part as that evening a storm blew in. We lost power for a while. The next morning we arose to very strong winds and unfishable conditions. 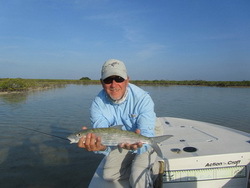 Later in the day the sun came out and I managed one small jack in the canals and one bonefish in Flamingo Lake . The wind never did let up during our stay. I was still able to fish the following two days at Flamingo Lake . The fishing was difficult due to the wind and silty water. In all, I managed to hook 14 bonefish in a little over two full days of fish. Not bad considering the conditions. I guess that is why they call it fishing rather then catching. I did set a new standard for myself while fishing on Flamingo Lake . 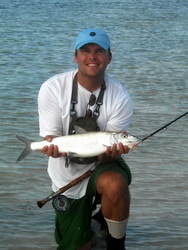 I had hooked a bonefish that had run far into my backing. After reeling in some of the backing, my line went limp. I figured the fish had snapped my leader. I continued reeling in when I realized that the leader hadn't snapped, but that the Albright knot connecting my fly line and backing had failed. I looked out into the lake and saw my fly line floating on the surface 20 yards out in the lake. I figured the fish must have come of. I walked out and grabbed the fly line. As soon as I grabbed it, the line shot out of my hand and another 40 yards out into the lake. Obviously, the fish was still on. I quickly yanked my fanny pack up to my armpits so my digital camera won't get wet. Off to the races I go charging out into the lake. I grabbed the line, quickly wrapping it around my hand several time and the fight was on!. 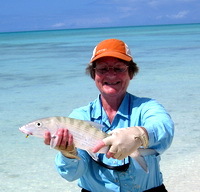 After several minutes, I was able to land by hand a nice four lb bonefish. Defiantly a personal handline record for me. I've since called my buddy at the flyshop who tied the knot and gave him a good ribbing about his knot tying skills. on USAir, they unfortunately lost my spinning rods. for more of an adventure until my wife spotted tailing fish there one afternoon. Using Barry's rod, I landed my first fish of the trip within 100 yards of my villa. 5 lbs. Taxi driver blew horn at me saying "He want to eat dat fish.why you let him go!" Saw many more fish on Flamingo Lake that day. Sometimes the best things are right under your nose but not seen because they are too close. 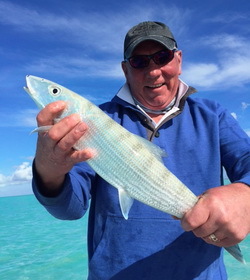 I took my brother to Harbour Club Villas for his 40th birthday for 3 days of bonefishing. The accommodations were great--Barry and Marta (owners) were fantastic. I work in the hotel industry and was very impressed with the hospitality provided by Barry and Marta. They were the perfect hosts! Barry drove us to the IGA on the first night and we were able to get all the supplies we needed for our stay. This store has everything--no need to bring any food or drink with you. As for the bonefishing caught a nice bonefish (4 lbs) on the first afternoon blind casting on the flats in front of the hotel. Took the kayaks around the point on the second day and saw a few bones, but they just weren't interested. The water was the clearest I've ever seen--what a beautiful spot. 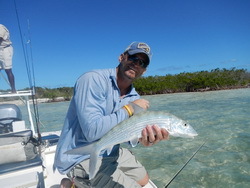 We hired a guide for a half day and have never seen so many bonefish--unfortunately, we only caught three. Our casting was a little rusty, but we had a blast anyway. I would definitely recommend Harbour Club Villas to anyone that wants to get away from it all. 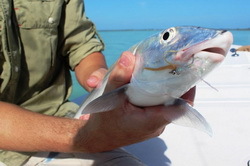 For light tackle enthusiasts keen on catching bonefish, Barracuda, snapper, Jacks and other fishy friends in shallow clear water, I would have to say that the Harbour Club Villas have the paramount location. 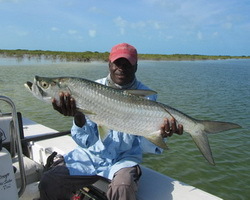 Flamingo Lake holds many Bonefish, large ones too. I battled to find them at first because I had never actually fished for them before and there was a bit of wind around making it harder to spot the fish. I did however eventually come right and by the end of my week I had landed (and lost) and fair number of really healthy sized Bonefish. I found the Average fish to be around 3lb's but I did get some perhaps twice that size. This all happened in the part of the lake right in-front of the villas! 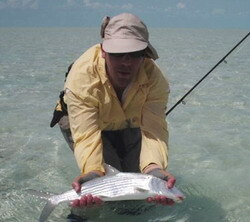 For any fly-rodders trying for Bonefish for the first time. heres a little tip: Have your reels drag set the way you want it before you hook a fish and keep your knuckles clear of the handle while the fish is doing a run. It hurts. There is a fantastic ocean flat a little down the road from the villas, which has a lot of potential. I fished there on one occasion and although I never saw any Bonefish, I did get broken up by something big using a spinning rod. 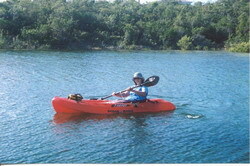 If you have an opportunity to hire the services of a guide for a day or two, go for it. It's a great way to see some amazing flats and uninhabited cays. Although my best fishing was still in the lake, I would still recommend it to be a fantastic day out. Wear lots of sun-block ? I didn't. Other than that, I would just like to say thank you Barry and Marta. 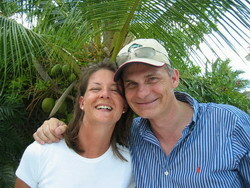 You are wonderful hosts and know the island incredibly well, which is a big help for a city boy like me. Hey Geoff and Darren, Marta and Barry. and then go back to the docks to celebrate. The capt. said it's the second best day he's ever had and he 's going to put us in marlin and saltwater sportsman magazine's. We really had a geat time and have been telling all of our friends about how great our trip was. Hope to hear from you soon. Larry says "As for my picture shown above. It seems I'm a better photographer than Brad!" I have attached it, just for evidence!" Brad's fish is shown above and what a beauty! Ask Marta to tell you where he caught it??? ?